Beary Cute Cupcakes and 25% off Bear themed product! A Beary beary nice sale! This week enjoy 25% off select bear themed picks, cookie cutters, royal icing decorations, cake toppers and much more! Sale lasts through Sunday, July 25. Perfect for birthdays and other celebrations – stock up on all those cute little teddy bear decorations Fancy Friends! 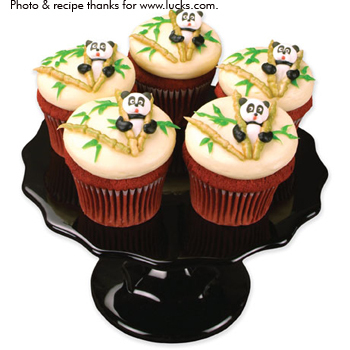 And while your at it, try out this adorable panda cupcake recipe thanks to Lucks.com. We love their sweet panda face decorations. You can read the how-to recipe HERE. Also don’t forget to browse our latest summer newsletter.